This kind of brick factory adopts the twice setting process that is semi-stiff extrusion, drying by the tunnel dryer with small section and fired by Hoffman kiln. The dryer adopts brick-concrete structure and pre-cast concrete roof. The drying agent is the residual heat from Hoffman kiln. 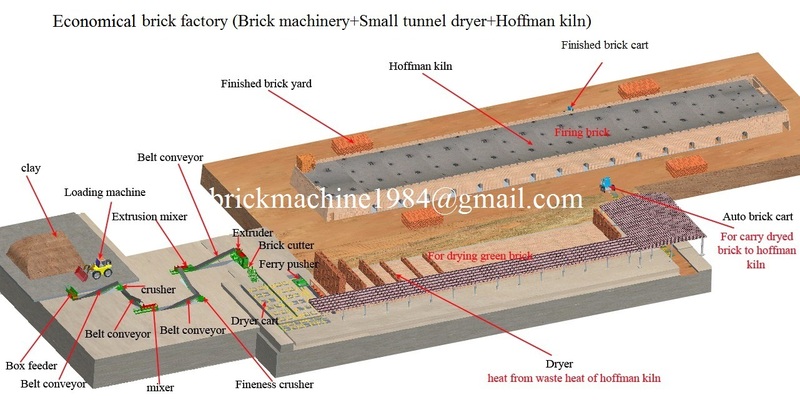 The quality of the brick drying will be ensured by adjusting the system to control wind volume and temperature.Dried green bricks are transported by tractor to Hoffman kiln where they are fired to finished bricks. of high cell rate brick, low acceptance rate. 7) Fuel: Coal,gas,heavy oil etc..